As the number of global DJs and dance events rise higher every year, more and more people expand into new territories to create room for the masses. One stage that hosts a growing number of performers every year is the great outdoors. Want to brave the elements, protect your gear, and protect yourself from the harshest shows on Earth? Today’s article is full of advice from pros like DJ Dan and Christian Martin. Normal gigging takes a toll on your equipment, even if protected properly, but exposing your gear to the elements can mean certain doom if you don’t take strict care of the tools. Extreme conditions vary depending on what type of concert you plan on attending. Weekend camping festivals like Coachella and Bonnaroo are supported by the same modern infrastructure you would expect to find at any venue. Festivals like Burning Man, held annually in the middle of the Nevada desert, offer little when it comes to creature comforts or even having a safe space to perform, yet this doesn’t stop almost 70,000 people from attending annually. The Burning Man festival is a poster child for what constitutes an extreme gig. 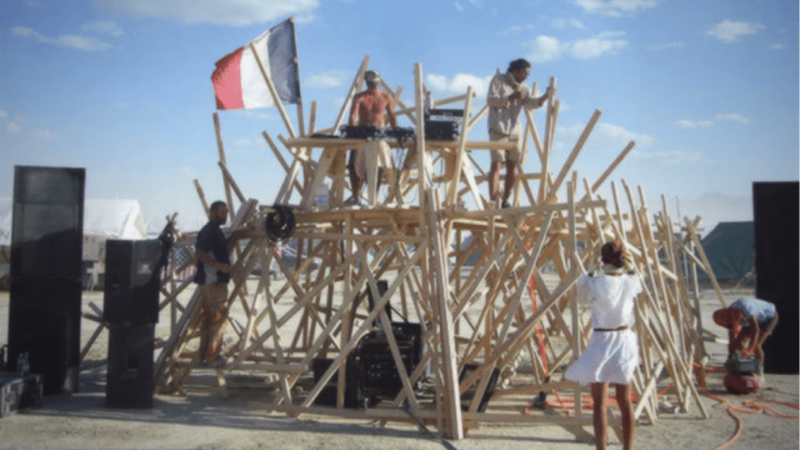 Located outside of Reno, NV in a former nuclear testing ground, the event is a literal cityscape complete with enormous sound camps such as Root Society, Opulent Temple, DISTRIKT, and the newly-minted White Ocean. Weather conditions are brutal. Dust storms that last 24 hours are not uncommon on the desert playa, coupled with unpredictable rain, hail, and high winds that will leave you chafed and burned. Before performing in a harsh climate, realize that all the equipment you want to bring should be somewhat expendable. The unexpected can happen at any venue, but only in extreme conditions is your gear guaranteed to overheat, short out, and fail altogether. To get around this, we recommend planing out an alternative setup which best suits your performance needs and consists of gear you would not mind totaling. Shade: whether mixing with vinyl records or shuffling through songs on an iPhone, always make sure to perform in a shaded area. Dust will break your devices down slowly, but heat can cause your performance to come to an abrupt end. Elevation: Keeping your gear raised up so it can ventilate properly will also go a long way in preventing overheating on stage. Pack It Up: Never leave any of your equipment unpacked or unattended when not in use, unless you want to start an expensive paperweight collection. It’s wise to store everything in sealed containers if possible. Be Ready For Anything: In these conditions, the unexpected should be expected. Laptop computers tend to be too fragile and expensive at events like Burning Man (plus, the alkali in playa dust wreaks havoc on most electronics). Many experienced DJs opt for a set of CDJ decks, a mid-range mixer, and a large catalog of burned CDs. Sound camps typically keep a stockpile of CDJs on hand for replacing burnt-out decks, and it’s not unheard of for camps to borrow CDJs from others for their DJ booth (even during the middle of a performance). WHAT IF I NEED MY LAPTOP? You may be wondering what options are available if you need a laptop to perform. Expect to deconstruct and clean every individual part post-burn, but with a few precautions and some common sense, you and your laptop just might survive. The common sense: do not bring your brand new, pristine MacBook Pro or any other valuable device to the desert. If possible, bring a cheap second-hand laptop with you (old 12″ black MacBooks are great for this). Also consider what extras you’ll need to complete your rig – make sure to cover all these angles before hauling out to Nevada. Pelican Cases and OtterBox are two premium brands which offer exceptional storage and can definitely take the heat. Gregg Gillis of Girl Talk has been known to bundle his entire laptop in Saran wrap to protect it from sweat and spills on stage. This method gives your machine a thin layer of protection from playa dust, but it can also prevent your laptop from ventilating properly and cause major overheating issues. Many BM veterans have recommended cheese cloth held on with gaffers tape for these purposes, allowing for airflow while providing some level of playa protection. Effect69 who created a Homer Simpson sector 7G-style bio-hazard box to drop over top of their computers on stage. Leave your shiny Vestax VCI-400 SE controller at home and bring something a bit more disposable. Many middle-of-the-road DJ controllers can be had on eBay and Craigslist for under $200 – they may not have cutting-edge feature sets, but the bare essentials and a built-in audio interface are all you need to get the crowd going. Controllers such as the Numark Mixtrack Pro and the Hercules DJ Console MK4 make for inexpensive all in-one boxes capable of routing audio to a mixer or PA system. Many DJs continue to mention the Native Instruments Traktor Kontrol S2/S4 controllers, because of their solid construction (very few gaps for dust to collect in) and their on-stage reliability. In 2012, DJTT friend Joe Andolina brought his S2 out to Burning Man and sent over this picture of what it looked like after a week in the desert (the controller miraculously survived, needing only some deep cleaning. In general, controllers have very few sensitive electronics and can survive a serious beating. One funny example came from Ean Golden after shooting this video with Richie Hawtin. We had my Midi Fighter Pro on camera for the entire pool shoot in Ibiza and Rich was concerned about getting it wet. No problem! I explained, we can soak the thing and it will still work for sure. Turns out that the entire pool ended up on the controller at some point and much to my surprise, it failed to start up a few hours later. Still, convinced it was just water-logged, I took the controller apart, dried it off with a blow dryer and VOILA, the Midi Fighter Pro still operates perfectly to this day. Using an iPad as either your primary DJ device or as a controller on a rugged stage has many advantages over a traditional setups: it’s extremely portable, easy to protect, and there’s a variety of software up to the challenge. The tactile sensation leaves a bit to be desired (especially if sealed in a plastic bag for protection), but that also means fewer parts that can be destroyed by the environment. Depending on how busy your DJ schedule is, consider one or even two of these backup plans – but don’t exhaust yourself by playing DJ sets at every opportunity. Take time to relax and enjoy the atmosphere while also taking care of essentials like food, water, and shade. Upon returning, you’ll have to completely dust off and scrub the insides of your precious audio hardware. If you sealed things up with gaffer tape, some of the work will be easier to manage. The objective is to completely disassemble each piece of gear to give the interior and circuit boards a thorough cleaning. Player dust will slowly erode the electrical connections inside, so the sooner you can begin dusting the better. To begin, pop off any knobs or fader caps on the face of your controller. Using your screwdriver, remove the outer case of your hardware (sometimes screws can be hidden beneath rubber feet or stickers warning you about voiding the warranty) and keep disassembling until you can safely access all angles of the interior components. Be extremely careful about unplugging any cables you might encounter and not forcing any parts that don’t want to move. If in doubt – leave it! Once disassembled, grab your spray bottle of vinegar and warm water. The vinegar will act as an acid to help neutralize any caked on playa dust you might have found, and yes, you can clean your electronics with a bit of water without causing a problem (do not plug it in/ turn it on if there is the slightest hint of moisture on the PCBs). After a bit of spraying you should be able to wipe away some of the exterior dirt and grime. The crevices between each of the knobs and sliders will need extra attention – blasting a little compressed air along the seam will remove excess dust, while a tiny amount of Deoxit will lubricate the control and restore it to a fluid action. After letting your hardware dry out, carefully reassemble and remember to reinstall any cables or connections. Once complete, try plugging in and powering on after the circuit board is completely dry. Some of the best holidays for partying down come around in the fall and winter – and they’re all great reasons to maintain your core temperature by dancing outside. 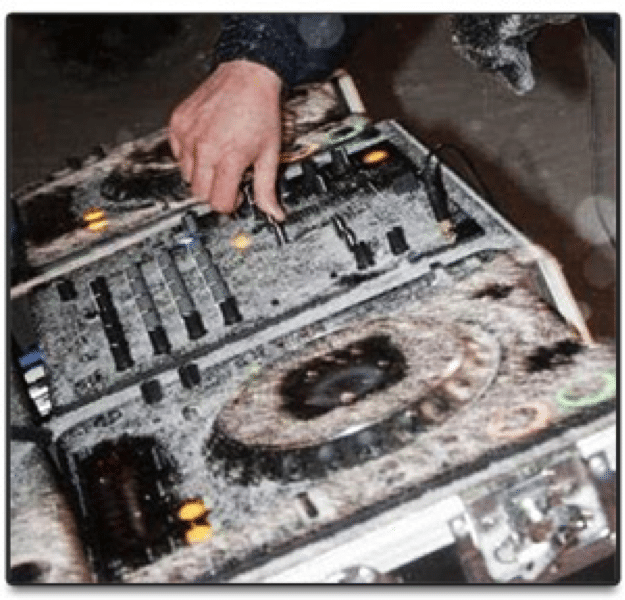 Though much less hassle than DJing in a desert, wintry and wet conditions cause moisture and condensation – just as detrimental to your gear as heat and dust! Condensation Creation: Be aware of when you move gear from a relatively cold temperature to a relatively warm temperature since this quick change can cause condensation to form on the inside of your electronics. Let It Sit: Keep gear unplugged and let it gently return to room temperature after a performance so as to prevent any major malfunctions. Even letting your CDJs, mixer, audio interface, and laptop air out for a couple of days isn’t a bad idea. If you power on with any trace of moisture inside, consider your gear as good as fried. Running Cold: Icy temperatures can cause machines to act strangely. Laptop screens will slow their refresh rate the colder they get, eventually ceasing to display an image. CDJ decks’ motors can slow to a snail’s pace when operating at very low temperatures. Also note that cold gear will need to warm up before it can drive sound or even appear to be powered on. You may assume one of your components has kicked the bucket when in fact it just needs some time to get ready. Heat The Booth: Outdoor events should provide the DJ booth with some kind of heater, as well as a tent or canopy to trap in warmer air. Though the idea of performing in extreme conditions may sound harrowing, the experience comes highly recommended. A crowd can enjoy themselves at any venue, but playing in the great outdoors creates a special vibe for the DJ and the audience, a communal atmosphere that you just wont get anywhere else. Sure there is risk and reward, but it all makes for a great party experience in the end. Posted by and Credit to David Schulman SCHULMAN on August 19, 2013. Do you have experience DJing in extremes? Share your stories.